With one broad sweep of a word-processing program, NY Times Columnist David Brooks brushed off the Newbery Award collection of the best children’s novels as containing some “exquisitely sensitive novellas” in his essay Honor Code (July 5, 2012). He should reconsider this judgment on several counts. Simply because a book is written for young audiences (elementary through middle school) and is shorter in length than an adult novel does not mean the book is a novella; the Newbery Award books are novels. However, on several occasions the Newbery has been awarded to books of poetry (1989 Medal Winner: Joyful Noise: Poems for Two Voices by Paul Fleischman) or short stories, songs and poems (2008 Medal Winner: Good Masters! Sweet Ladies! Voices from a Medieval Village by Laura Amy Schlitz). As to the charge that some of the Newbrry novels are “exquisitely sensitive,” well, yes, some are. I am “exquisitely sensitive” myself when I remember my reading the 1963 Medal Winner: A Wrinkle in Time by Madeleine L’Engle. However, while I can only comfortably include those titles that I have read or recommended to my students, there are fewer “sensitive” novels than one might suspect, in fact, some of the Newbery Award novels are brash, outrageous, or disturbingly violent. More than a few of them have been banned. I would also like to give a shout out to the one book that was read by every “rambunctious” boy I ever taught, the 1988 Newbery Honor book Hatchet by Gary Paulsen. For many boys, this is the ONLY book they remember. Newbery authors do not write in order “to tame” rambunctious youth, boys or girls, and I would suspect that several would take great offense to that statement. Authors for children and adults alike write to tell an extraordinary story, to share an experience, or to give voice to a character or person from the “margin”, an outsider who has a voice through the written word. 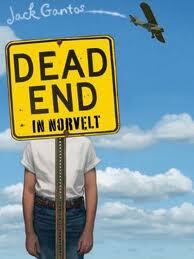 Many authors are not “tame” themselves, in fact, this year’s Newbery Award winning writer was Jack Gantos for Dead End in Norvelt. Gantos has a fascinating back story. He was convicted as a young man of smuggling drugs and spent time in a federal prison. His behavior, in fact , was very much like the behavior of Prince Hal of Shakespeare’s plays. However,Gantos was a reader and found great literature to guide him during times of trouble. While in prison, he was without a notebook and wrote in the margins of The Brothers Karamazov, intertwining his words with Dostoevsky . His memoir of his felonious behavior is called A Hole in My Life, and we teach the text as a required read in our Grade 12 Memoir class. The Newbery Award winners reflect the rich diversity of literature that is available to students, rambunctious or not. These novels are not assigned “to tame” , but they are assigned, or recommended, to comfort a reader, to entertain a reader, to challenge a reader’s beliefs, or to incite a reader to action. They may be short, but they are not novellas, and no teacher “pretends” they are the solution to educating a fiercely rambunctious student. Most teachers know that these Newbery Award novels, and their Newbery Award honorees companions, may be the only solution for educating that fiercely rambunctious student. Like many authors who rely too heavily on the internet and too little on real experience, columnist David Brookes has missed the point of Newbery (one r, by the way) Awards books–specifically how the selection process works. The books selected for these awards generally need to meet standards that are far beyond the mere election of a “good book.” The length of books is often a characteristic of good fiction for kids because of vocabulary considerations, reading speed of youngsters, etc. The length is not geared for adults but for the audience of intent. That YA authors can cram so much into a shorter book is a credit to their writing skill. Content that is equally valuable to adult readers is also a factor. Books for young people should not be trivial in nature, despite the popularity of a given theme. For example, the Twilight Series is not exactly high-quality reading, despite their popularity. On the other hand, a series like the Hunger Games IS high-quality reading. The Hunger Games–which I started reading from the first week the first book was published–deals with issues of strife, politics, society, the future, in ways that the Twilight Series cannot even begin to address. It’s not that the Twilight Series is “vampiric” in nature–I’ve read plenty of great “monstrosity” books–but that the whole relationship between child and parent, among characters in a love triangle, about the very essence of adolescent life are unrealistically (read over-romantically) presented. Despite the dystopian, science fictional environment of the Hunger Games, there is genuine strife and genuine regard for individuals–including adolescents–for the choices they make and the reasons for making those choices. In Twilight, Bella is contrived; in Games, Katniss has choices forced on her by circumstance and social (and political) pressures. Katniss does not suddenly develop skills she did not know she had, unlike Bella who seems to conveniently develop certain talents just before they are needed. Katniss’ success is based in part on skills learned of necessity in (given the environment) a realistic setting. She uses those skills, sharpens them, learns from watching others, and is finally approached to become a symbol in a political game between sectors because this symbolism is the best way of getting what she wants for her family and community. Along the way she is advised by many and needs to learn who is truly trustworthy, how much of herself she can share–all the influences adolescents and adults grapple with daily. When I taught special education classes for severely emotionally disturbed, I used “The Whipping Boy” to help “teach” socially appropriate behaviors. We would discuss why the prince kept doing things that his favorite whipping boy would find troublesome, how the two became “frenemies” to enhance each other’s skills, how the relationship developed, how different behaviors would have led to different consequences, etc. It became an instructional tool to reach students on the why’s and how’s of behavior that would create friendships or at least acceptance in greater society. Brookes’ identification of what was mostly classified as adult literature is generally written for adults, who are supposed to be able to maintain focus on a single publication for longer than a teen-age boy would. In the education profession, by the way, there has been much discussion as to whether the classics often read in high school classes were chosen as much for brevity as for content. But back to Awards books. As listed above, books like Neil Gaiman’s “The Graveyard Book” hold so much more than just a series of graveyard adventures–there is obvious symbolism, there is finding one’s roots, there is observation and outright disobedience, all themes relevant to young adult male readers. “The Giver,” another dystopian society book, carries many of the same themes as “The Hunger Games.” It is another book that holds the interest of adults as much as it does of adolescent boys (although boys prefer more action). The key within all this wonderful literature is appropriate length as well as substance. Girls are much more likely to plod through a longer book, and often begin reading adult-oriented books long before a boy will even think beyond the thickness of a book. In addition, girls are more often allowed the choice of athletic participation than boys. Boys continue to be socialized differently from girls, despite the efforts of many parent groups. Anyway, Brookes gets paid to write a non-news oriented column. He does not necessarily get paid to do any research to back up his words. Sorry about the spelling correction! 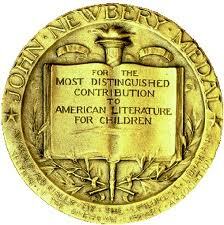 When I was a kid, we had a J.J. Newberry in town, and for many years as an adult, I spelled the award name the same way. It wasn’t until a fellow teacher pointed out my error several decades ago on the Internet that I, too, looked closely at the medal! By the way, I’ve used several of the books–often those that would be considered lower-that-age-appropriate–in special ed teaching. Many of my students had never even heard a nursery rhyme at age 11 or 12. The “younger” books really were big helps to them learning about their behaviors and how to change them; and I always started with Newbery and Caldecott books. Anyone can write a children’s book. It takes special people to write excellent children’s books. That’s my motto and I’m sticking to it, Brookes not withstanding. Love your blog. Esp. the one about “to pass or fail”.